If you are an event promoter, you’re using social media. If you have read our guide on social media for event promoters, you are using it well. The next step in building your audience is creating an effective content marketing strategy. Content marketing is value that event promoters share with their audiences. This can be anything from industry news, self-shot video, blog posts, or photo albums. The idea is simple: if you want to hold your audience’s attention, you need to provide value. Content marketing is the core of marketing channels like email marketing and social media marketing. They operate side-by-side. If you only create content on your blog, no one will know it’s there. If you have no interesting content to share you’ll never drive consumers to a buy tickets online. Content marketing has been around for a while, but it is still effective. It is still big business. Blogs account for 500 million monthly page views in the US and the digital marketing industry is worth $62 billion worldwide. Let’s dig into this marketing channel with an analysis of the best event promoters. We have used this technique before in a social media analysis. The same rules apply and be careful where you gather advice. There are plenty of gurus touting outdated content marketing advice. Ask what these people have to gain by giving this information. It is often personal website traffic and these gurus are great at compelling writing. Ask if you believe they have ten years filling venues. Are they worthy of your time and trust? It’s critical to realize that leading event promoters are busy selling out events. They have results-driven content and social media campaigns. They also continually improve them. They provide far more value executing their craft than teaching. Let me introduce you to the technique of benchmarking. The first thing I do to improve a strategy, is to benchmark against similar businesses. Similar businesses that do content marketing well. I like to use “big names”, as well as a smaller business with a similar model. Let’s pick a small handful of promoters or venues that promote well. The idea is not to copy the best. I look deeper at what the benchmarked companies have success with. Since the content is shared on social media I look at social media effectiveness. For example, I don’t only look at vanity metrics such as Facebook likes. I look deeper at what sort of content is generating engagement, shares and comments. Do not focus on Twitter followers. Dig deeper and find the which type of tweets are shared the most. What content types are getting engagement? What unique strategies are driving results? Our article Social Media for Event Promoters outlines strategies for content promotion. Here we will focus on sources of content. When you need to promote your own event, use it as an opportunity to showcase your performer’s talent. Instead of posting basic information about the event, write a blog post explaining who the artists are, where they came from, and what they have accomplished in the past. Intertwine this with information about your own event. Don’t be a grey-beard either. Content marketing allows more opportunities to interact with the reader. If you are hosting a DJ, insert their mixes or Spotify playlists into your post. If you are showcasing a live band, put some of their best Soundcloud uploads, or a popular music video, at the end of the article. Social media does not allow this flexibility. Note the little amount of text in the article. These people keep it simple and they keep it interactive. This post could be put together in 20 minutes which is critical as Pacha composes 2-4 articles per day. Also note the cross promotion nuances of the article. Pacha is not bragging about themselves. Pacha is self-promoting by promoting others. This allows them to remain professional and also leverage the audience of the performers. 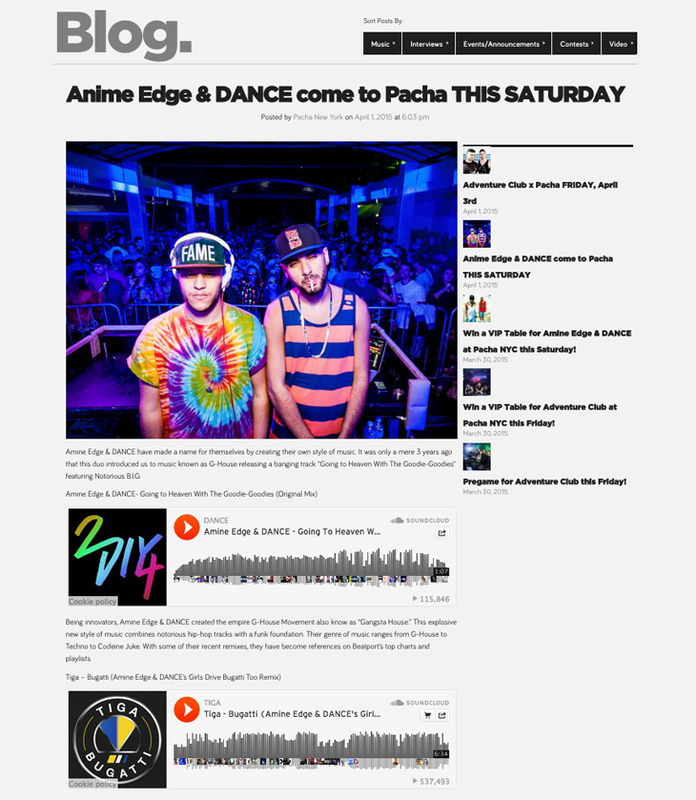 Pacha does a great job of linking to other articles. Yet, one thing they miss is an email capture somewhere in the article. We discuss email marketing in the Email Marketing for Event Promoters article. Don’t fear the workload of a blog. I know you’re busy. But you don’t need to create unique content all of the time. You can also curate your content. Find interesting content from around the web and share it with your audience. Your audience doesn’t care where the material comes from. Your audience only cares about value. This article originated from VH1.com. But, the post has an amazing amount of likes, shares, and comments. Drai’s anchored their name to the article with a simple announcement at the top. 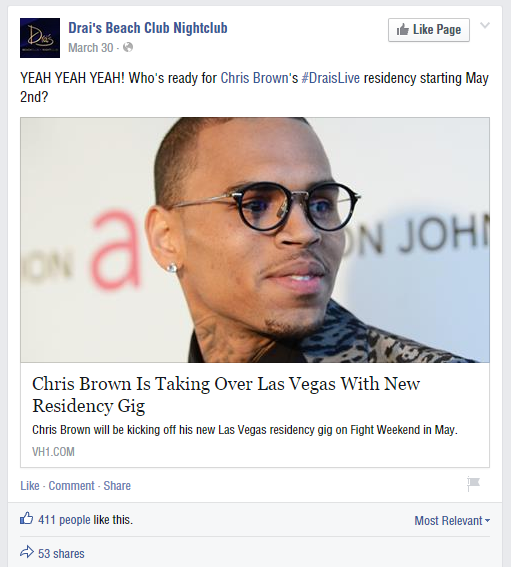 The VH1 article was about Chris Brown’s upcoming residency at Drai’s Nightclub. So it was an easy choice for the company to share. This is a common technique. Do not worry about offending VH1, they are simply happy to have their article read. This is cross promotion. They win when you promote their material. You win by repurposing the material. If an upcoming act is featured in the news, post it on your Facebook page and tie your name to it. Content curation is one of the best strategies to keep your audience engaged. It doesn’t have to be about an upcoming act of yours either. Share any relevant industry news you think your readers would enjoy. Just be professional and do not mislead people. Ministry of Sound makes excellent use of its online blog. They call it a “magazine”, but make no mistake, this is a blog. Again, an astounding amount of likes and shares. Part of the reason this article worked well is because Ministry of Sound knows its audience well. They are a company focused on electronic music, so an article about collecting vinyl was a good choice. Don’t be superficial, let’s look deeper into this article. Glenn Hickling of Global Groove Records wrote this article. Tickling doesn’t even work for Ministry of Sound and it is likely he wrote the article for free. If you have a large audience, people will want to write for you as a way of promoting their business. Seek these relationship and leverage the content. 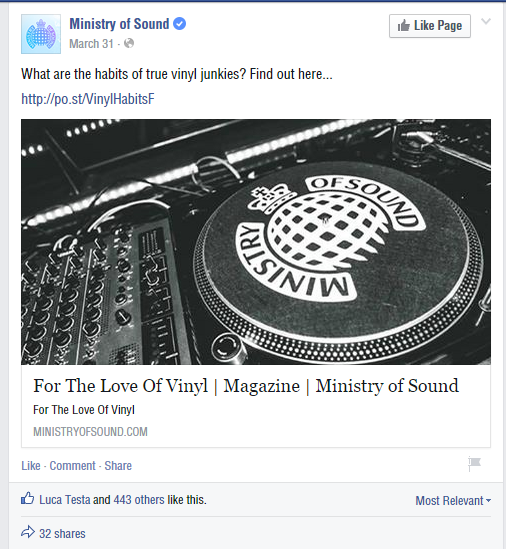 Let’s have another look at a great post by Ministry of Sound. Another great article with amazing engagement on social media. They are also leveraging the fame of another, and providing value through interesting content. Let’s dig a bit deeper into this article as well. Click through, scroll to the bottom and you will see Tamara Roper wrote this article. A LinkedIn search reveals Tamara is a freelance writer. She has written for many publications in the past. In other words, Tamara is hired help and various organizations hire writers often. Even Ministry of Sound’s editor writes for other publications such as Vice, Noisy Music, and Mixmag. Content creation is one of the most effective ways to built and grow an audience. We’ve illustrated four tried-and-true techniques for building a strong content marketing strategy. If you apply these techniques regularly, in combination with social media, you will get results.